On our first step, we take a look at the races that occur in 13th Age. It’s important to note that my view on the races is based on my feelings of races in the realm of fantasy role-playing games (RPGs). Per the author’s notes, these races can be shaped and changed to match the visual appearance that fits with your ideas. Resembling a dragon-like humanoid, the Dragonspawn are a sight to behold and capable of a quick breath attack should the occasion call for it. Dwarves are a clan-based hierarchy that are strong and hardy who take good care of the magical items on themselves and anyone they cross. Cruel, dark-skinned, and brewed in the families of the world’s greatest villains, they show their quickness in their wit or reflexes. Beings of light and grace who use their intelligence or force of personality to engage with the world. They’re one of the most magical beings in the realm. While High Elves representing light, and Dark Elves representing darkness, Wood Elves represent the earthy in-between. They use their grace or perceptiveness to gain advantages over the mortal races. A mixture of mechanics, alchemy, and magic, the Forgeborn are constructed beings. They are strong and hardy making them excellent guardians to protect and serve. Historically, one of my favourite races: they haven’t really changed much. They are underground dwelling, small people known for the dexterous hands and intelligent designs. They enjoy tricks and eccentricity. While there are a few elves who mate with humans, there is also room in the backstory for half-elves serving as a connection a long past war where the Elves and Human empires fought together – their result was the Half-Elf race. As a result, they serve as ambassadors of good faith between the two races. Representing humanity with a ting of the bestial, half-orcs are more at home where their natural talents of strength or agility are useful. Rather than being the offspring of a pairing of humans and orcs, it is actually due to the presence of orcs that breakouts of half-orcs are observed. My second favourite race (but don’t let that tempt you on way or another). I generally like the smaller races for the different perspective they provide. They almost force you and the group into playing the characters. Little is known about these small, sturdy, quick people. For that reason, there are a lot of thoughts on how they came to be. I’ll leave the mystery for you to think up. Touched by the gods, the Aasimar are created when the presence of the divine draws near to a population. With the divine protecting them on their course, they are truly stalwart companions. Whether you see it as a curse, or a blessing, this race has an infernal heritage. This shows by having demonic elements such as forked tongues, horns, and/or prehensile tails. Whether by the situation they are forced in, those affected by this bloodline have grown stronger or more intelligent to cope with their lot in life. You’re standing at the front of the room. Rows of desks filled with your peers smiling up at you. You walk to your seat after your presentation. You nailed it. All that prep was worth it. What does this have to do with 13th Age? That’s right folks, we’re talking about classes! 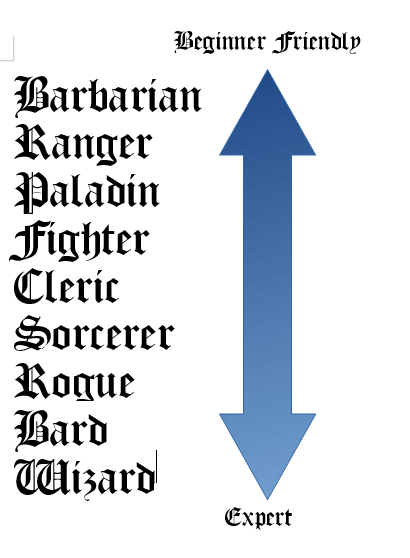 A simple chart listing the classes in order of difficulty from easiest to hardest. The classes here are put in order of difficulty for easy reference. This doesn’t mean that a new player cannot play a more advanced class, but rather that there is more time involved in learning this character and playing them effectively in combat situations. Below you fill find a handy break down on each class. Whether it’s a primal rage or a cultured one, Barbarians are fueled by rage and are exceptionally good at hitting whatever they desire. Minstrels, storytellers and jesters, bards are known for their jack-of-all trades ability and their way of spinning stories and songs to entertain or satirize. It is a rare individual who is able to commune with a deity. The gods are rather silent in this age unless you’re lucky enough to have a blessed one speak to you directly. Clerics spread the word of the gods (or one god) and fight as a practical matter. Whether you’re a soldier on leave, a mercenary, a guardsman, or a former gladiator, the fighter is proficient with weapons and armour. There are as many flavours of fighters are there are roles in an army and then some. While clerics may be the mouthpiece of the gods, the paladin is their firm hand. They are martially trained to complete missions for these gods and what is right. While they not all be bastions of good, their aim is laser focused. Whether it’s through martial training, or just a nomadic lifestyle that has left you with the senses to survive in the wilderness, the ranger is a formidable foe in combat working as bounty hunters or trackers. The rogue class is a varied one that can feature thugs, riffraff, charlatans, treasure hunters, bounty hunters, thieves, or diplomats. This is an extremely varied class who focuses on working with allies but also works well on its own. The winds of magic are a ever blowing in 13th Age and that power has trickled down to ones who have not studied its long-lasting effects. To say that a wizard and a sorcerer are the same would be very far from the truth. A wizard studies intensively to understand each spell cast, while a sorcerer just channels their will into magic. The latter is a lot more dangerous when you don’t understand the effects your will may create. Studying arcane books of the Archmage, the lineages of arcane masters, or the school books from their academy. The books are less important than the time and learning process the learned masters of magic put into calculating every arcane formula. To continue on the character generation adventure, click the next button below. To head back up to a particular class, please see the links below. Okay! So you’ve chosen your class, your background, and your race. These selections grant you with a number of choices of skills, features, and dice rolls. In this section we’ll talk a bit about how to generate ability scores and recommend some ways to assign the scores you get. The way that 13th Age generates ability scores is a lot like how other contemporary (d20) style role-playing games complete their ability scores. Please forgive me if it this seems a little repetitive. There are a lot of ways to generate ability scores. We’ll go into some of the common ones and then talk about important abilities for each class. Keep in mind these are merely instructional and your DM will tell you how to generate scores. Also known as 4d6dl1, this style is a carryover from Dungeons and Dragons. Rolling this way produces generally higher rolls than it’s predecessor 3d6. Once you have rolled 6 times (one for each ability score), you can then assign them into whichever order is beneficial to you. What if you didn’t get to choose your ability scores? What if, just like in life, you were stuck with whatever given talents and abilities you had? That’s what organic character creation is for. Instead of choosing where your abilities will go after they are rolled, you go down a predetermined method and put whatever you roll into that ability. For example, going top to bottom or bottom to top and whatever you roll is what you roll. I use this style when I don’t know what I want to play and it’s open table because you can get such interesting combinations. In this section, we’ll discuss the ability scores and what they measure. There is a great way that I learned from the old Internet back in the day as defined by its relationship to a tomato. Dexterity is the ability to dodge a thrown tomato. Constitution is the ability to eat a bad tomato. Intelligence is knowing that the tomato is a fruit. Wisdom is knowing that you don’t put a tomato in fruit salad. Charisma is selling a fruit salad made from tomatoes. Depending on your game master’s (GM’s) play style, the combat statistics could be the most important part of your character sheet. Alternatively, they could also be the least important statistics on your character sheet. To completely fill out your character sheet, you’ll need to know a little bit about how it works. Your initiative determines you turn in a round. The highest initiative goes first. Your initiative modifier is the sum of your Dexterity modifier + your level. This is added to a twenty-sided die roll (d20) and compared to all participants in a list. Whenever you make an attack, you roll a d20 add the relevant ability bonus per your class and your level (+ magic bonus, if any). This is compared against the target’s defence. If the number meets or beats the defence, the attack hits! The type of attack determines what happens on a hit or a miss. The most common of these is damage. Damage is a number that is subtracted from the target’s hit points (HP). Even if you make multiple attacks, you still only roll damage once. At higher levels, you can double (5th level) and triple (8th level) your ability score modifier before adding it to the weapon. It’s important to note that negative modifiers are also doubled. Spells have a specific amount of damage and weapon attacks work differently. Armour Class (AC) is protection from weapon attacks. To calculate, it is the middle value among Constitution, Dexterity, and Wisdom. Physical Defence (PD) is protection from physical attacks. It is equal to the middle value among Strength, Constitution, and Dexterity (the physical statistics). Mental Defence (MD) is protection from mental attacks. It is equal to the middle value among Intelligence, Wisdom and Charisma (the mental statistics). How fast you move is important to imagine whom is closer to whom and how fast they can close the distance. Speed is determined by either common sense or stats and skills checks. I know you’re special. So you should have a special character! How you do that is by giving your hero something unique that allows them to stand apart from other heroes. This could be something as innocuous as my neck is unusually long all the way to an exceptional deed like being the only person who has been able to beat the Archmage in a game of chess. The goal here is not to create a superpower for yourself, but rather to hint at a story hook that the game master (GM) can use to build the world, create a story, or connect you to the world. 13th Age aims for collaborative storytelling so this is your chance to help build the world out more! Get creative! If you can’t think of anything, maybe ask the GM to either wait and see what develops or if they have any suggestions. Maybe you’ll get talking and figure out the perfect thing. As far as this icon is concerned, you’re one of the good guys. Good authorities often help you, and civilians often trust you. On the down side, you may be called upon to serve representatives of the icon even when you have other plans. You might also be a target of villainous icons or this heroic icon’s rivals. You’re probably one of the good guys, but for some reason, you’re suspect to this icon. Maybe you’re a convict who has served his time, or an imperial soldier who was too good and got drummed out of his legion. You have insider knowledge and allies who are in good with the icon, but you also have enemies associated with the icon. In the icon’s eyes, you’re a dissident, opponent, rival, or foe. You may have contacts or inside knowledge that you can use to your advantage, but some form of trouble waits for you wherever this heroic icon has influence. Thanks to your relationship with the icon, you are a hero to some, a villain to others, and possibly even a monster to a few. The enemies of your friends may turn out to be your friends, and vice versa. Advantages and complications will come from all sides. Your relationship with the icon is complex, an uneven relationship with an icon who’s a hero to some and a villain to others. One way or another, you can find help or hostility anywhere. You don’t just live in interesting times—you create them. Your enmity with this icon makes you some enemies, but it also makes you some useful friends. You may be a dissenter, unwanted family member, or even a traitor in some way. You are able to gain secrets or secretive allies, but your connection to this icon brings trouble from people associated with the heroic icons who oppose the villain. Be prepared to justify why you’re not imprisoned, interrogated, or otherwise harassed by the heroic icons and their representatives whenever they encounter you. Or for that matter, by the other PCs. You mostly work against the icon, but you’re also connected to the icon in a way you can’t deny. Your connection sometimes gives you special knowledge or contacts, but it also makes you suspect in the eyes of many right-minded would-be heroes. Whelp, that’s it. That’s the character generation process! Hopefully we’ve helped you along.